Those present at the Palais last night in St Kilda awoke the morning, still picking bits of glitter and confetti out of places they didn’t even know existed. 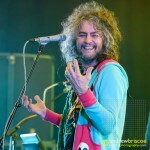 Wayne Coyne was in town with The Flaming Lips. Enough said. It was the New Year party everyone should have had.